Doesn't it look mouth watering? This is what was for dinner tonight! It's so simple, and the whole family loves it. I make it when I have left over chicken; so it taste even better because the spices have been sitting in the chicken, yum! So lets get to how to make it. Please note that the amount of ingredients are enough to make 2 pies. 2 1/2 COOKED diced chicken breasts. Preheat your oven to 350 degrees. Mix all of the ingredients into a large bowl in stir it all, place ingredients into the pie shells. Again this will make 2 pies. Put on the top of the pie shells and press the dough down into the rim of the pie so it cooks together. Then cut an x into the center of the pie. Place pie on a cookie sheet. Trust me if you've ever taken a hot pie out of the oven only to spill the while thing onto the oven door, then you have learned your lesson to always put pies on a cookie sheet. Let that cook for about 1 hour, or until the crust is a golden brown. Then remove from the oven and place it on a cooling rack. And whaa-la there you have it. Let this baby cool for at least 15 minutes before cutting. Now, as you can see it's easy and very simple and also very inexpensive to make. The best part is you can now put the other pie in the freezer and have a whole other pie to just pop into the oven! My husband and kids love it when I make this dish, and let me tell you I have some picky eaters! I love too that I don't have to serve anything else with it. It has the veggies and all in the pie already! thanks I know we'll love it. Hi Allie. Your blog is beautiful and chicken pot pie looks awesome. I never made chicken pot pie at home but I will def would like to try this winter. Also, your children are adorable! Thanks for sharing the recipe. I am always thinking about some ways to make my kid eat vegetables! Oh Allie! This look so good!!!! We had foggy wet weather today and a warm chicken pot pie sound perfect! I think I may be backwards, I love to eat this all year long. I love hot stuff even when its 101 outside. Allie, this looks so good...just right for fall. One question, do you drain the cans of mixed vegetables before adding them to the pie? I think you would but just want to be sure. I love chicken pot pie, and yours looks delicious! Thanks for sharing at Submarine Sunday! Yes! My mouth is watering!! We love chicken pot pies but I've never attempted one! Thanks for sharing on Sunday FUNday! This is awesome! I am pinning and featuring you tomorrow for the month features on Show me the Goods. 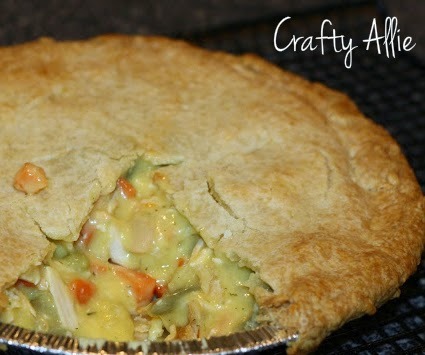 My husband loves chicken pot pie, so I will be making this the next time we have leftover chicken. Yay, so excited! Thanks DeDe! I'll look for it! And let me know how your pie comes out! This looks so yummy! I am following you back! What did you do for the top crust or did I miss something?